Anyone can do this! No drawing experience or skills needed. If you can draw a line with a pen (and it doesn’t have to be a straight line) you can create a Zentangle drawing! Everything you need for class will be provided. 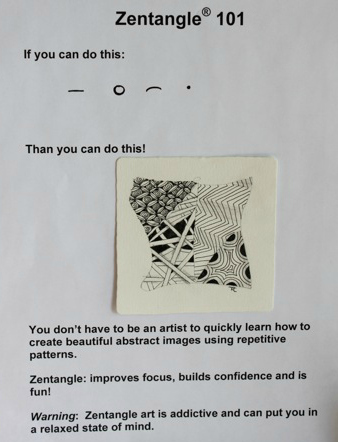 Zentangle classes are taught by a Certified Zentangle Instructor (CZT). All classes must be paid for in advance to reserve your seat.